CYNDI LAUPER KICKS OFF INTERNATIONAL 'DETOUR' TOUR IN NASHVILLE, TENN.
NASHVILLE, Tenn. (March 23, 2016) – Music icon Cyndi Lauper will take a southern DETOUR across the U.S. and Europe during her 2016 tour as the Grammy®, Emmy® and Tony®-winning singer-songwriter promotes her upcoming country record (tour dates below). 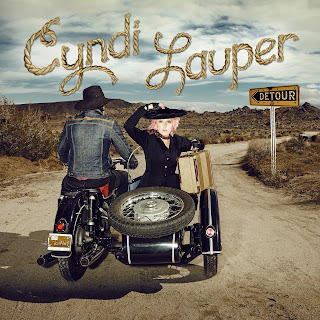 DETOUR, available May 6, includes her signature spin on a dozen classics from the 40s, 50s and 60s. The 27-city tour kicks off in Nashville, Tenn. at the Ryman Auditorium. “There’s something so very magical about the Ryman and all the rich history there. Just to think it’s the same stage where Wanda Jackson and Patsy Cline performed so long ago and here I am singing songs they made famous on this record - it’s such an honor,” Lauper said.